Imagine the 1980s. It was the time when everybody was panicky about AIDS as a new fatal and contagious disease and was highly on their guard with those who contracted it. People were afraid to sit next to AIDS victims and breathe the same air with them. And it was exactly at that time that Michael Jackson fearlessly invited the boy ill with AIDS to his home, dined with him and publicly embraced him inviting others not to be fearful of these people. Is it possible for an ordinary person to understand why a mega-star like Michael would prefer the company of a gravely ill boy to numerous valuable things which make up a person’s life? An incredibly famous and busy young man would spend his precious spare time with ill children like Ryan White instead of going to parties or living a carefree life full of joy and self-indulgence? And would take the trouble of calling his small friend, arranging his trips, buying him presents and lavishing him with attention while all this time he could have taken care of himself or relaxed from his hard work? Ryan Wayne White (December 6, 1971 – April 8, 1990) was an American teenager from Kokomo, Indiana who became a national poster child for HIV/AIDS in the United States after being expelled from school because of his infection. A hemophiliac, he became infected with HIV from a contaminated blood treatment. Healthy for most of his childhood, he became extremely ill with pneumonia in December 1984. On December 17, 1984, during a partial-lung removal procedure, White was diagnosed with AIDS. After the diagnosis, White was too ill to return to school, but by spring had begun to feel better. His mother asked if he could return to school, but was told by school officials that he should not. On June 30 1985, a formal request to permit re-admittance to school was denied by Western School Corporation superintendent James O. Smith, sparking a legal battle that lasted for eight months. Though doctors said he posed no risk to other students, AIDS was poorly understood at the time, and when White tried to return to school, many parents and teachers in Kokomo rallied against his attendance. White’s school, Western Middle School in Russiaville, faced enormous pressure from many parents and faculty to bar him from the campus after his diagnosis became widely known. 117 parents (from a school of 360 total students) and 50 teachers signed a petition encouraging school leaders to ban White from school. Due to the widespread fear and ignorance about AIDS, the principal and later the school board assented. The ways in which HIV spread were not fully understood in the 1980s. Scientists knew it spread via blood and was not transmittable by any sort of casual contact, but as recently as 1983, the American Medical Association had thought that “Evidence Suggests Household Contact May Transmit AIDS”, and the belief that the disease could spread easily persisted. Many families in Kokomo believed Ryan’s presence posed an unacceptable risk. When he was permitted to return to school for one day in February 1986, 151 of 360 students stayed home. He also worked as a paperboy, and many of the people on his route canceled their subscriptions, believing that HIV could be transmitted through newsprint. When White was finally readmitted in April, a group of families withdrew their children and started an alternative school. Threats of violence and lawsuits persisted. According to White’s mother, people on the street would often yell, “we know you’re queer” at Ryan. White attended Western Middle School for eighth grade for the entire 1986-87 school year, but was deeply unhappy and had few friends. The school required him to eat with disposable utensils and use separate bathrooms. Threats continued. When a bullet was fired through the Whites’ living room window, the family decided to leave Kokomo. After finishing the school year, his family moved to Cicero, Indiana, where White enrolled at Hamilton Heights High School. On August 31, 1987, a “very nervous” White was greeted by school principal Tony Cook, school system superintendent Bob G. Carnal, and a handful of students who had been educated about AIDS and were unafraid to shake White’s hand. Many celebrities appeared with White, starting during his trial and continuing for the rest of his life, to help publicly destigmatize socializing with people with AIDS – among them Elton John and Michael Jackson. When we went to restaurants, people would get up and leave, so they wouldn’t have to sit anywhere near me. Even in church, no one would shake my hand. Panic spread all over town. Lots of times kids flattened themselves against walls when I walked by. I heard kids telling Ryan White jokes. And grown people passed along lies about how they’d seen me biting people, or spitting on vegetables at the grocery store. I never did and I never would. When I finally did get back into class, after a judge said the school was wrong, an awful lot of people still wanted me gone. …The one day Michael Jackson called me. Wow! I didn’t know why he had, except maybe because he’s from Indiana too. He was in his car, he said. “If I lose you, man, I’ll call you back,” he told me. So I told him what I was doing, what movies I’d seen, what school was like, how John and I had been window-shopping for stereo – stuff I’d talk about to anyone. I said I was playing his albums. I liked “Man In The Mirror” the best. Michael’s not flaky or weird, like you read in those newspapers you can buy in the supermarket. He’s real quiet and softspoken. Sometimes he takes a while to say things. He’s just kind of gentle and peaceful. He was a nice new friend for me to have. “Next time you’re in L.A., we’ll get together and have some good old fun,” he told me. Well, I couldn’t wait. …On the day we were going to spend with Michael, a limo picked up Mom, Andrea, Heather, and me very early at our hotel. After we climbed in, we were told that we couldn’t take any cameras with us because we weren’t allowed to take pictures. About three hours later, about ten in the morning, we drove up to the entrance of Neverland, Michael’s ranch. Michael was wearing black pants and a red and black jacket and a black hat. He always wears my favourite colours. He showed us around the main house. Just like me, his dream is to have kids, so the house had a bedroom for a little boy and one for a little girl, plus a playroom with all kinds of toys and arts and crafts – even a miniature merrygo-round. At lunch – chicken, corn on the cob, and pumpkin pie – we met Michael’s monkeys. His famous one, Bubbles, wasn’t there, but the others made up for him. They all wore diapers and T-shirts in different colours. They have their own babysitters, and they go to school every day to learn manners. Their manners were pretty good! They hoped around and played with our shoelaces while we ate. Every now and again Michael fed them a treat. I never wanted to say goodbye to them. I felt very comfortable around Michael because I could see he was just as shy as I am. He seemed like a regular person to me. I certainly could relax with him. ….At lunch there was juice and Pepsi. Mom asked if there was any Coke. Then she remembered Michael’s Pepsi commercial. She really thought she’d blown it. Michael smiled. He knew what she was thinking. He said that Mom was just like his mother. So Mom got up the nerve to ask a mom-type question. “Michael,” she said, “is it true that you sleep in an oxygen tank?” That’s something the tabloids have said about him. …After lunch Michael asked me if I’d like to ride around part of the ranch in his fourwheeler. “Yeah!” I said. Andrea was going to try his trampoline, and Heather and Mom were checking out his outdoor hot tub that had a video screen on one side. Michael and I set out over the ranch’s dirt roads. I was at the wheel and he rode in the back. I took off and Michael yelled, “Slow down, Ryan!” After we’d gone a few miles he asked me if I could find my way back to the house. “Sure,” I said. I listed a few landmarks. …When we caught up with Mom and the girls it was getting late. We had homemade pizza for supper, and then it was time for us to drive back to L.A. I told Michael that I really, really wanted a photo of us together. So he sent someone out for a Polaroid camera, and drove down with us to the ranch’s entrance. Mom got some good shots, and then we said goodbye. On bad days I had to rely on the phone for social life. Michael called to say he was busy working on an album. “We’ve got to get together and goof off again,” Michael said. He wanted to know if I could come back out to the ranch after Christmas. …The drive took about three hours. The limo dropped me off at Bungalow Three for the rest. Michael said, “See you at seven.” That was suppertime. I was worried. My stomach ached and I was having cramps. I called Mom. I took a nap and went up to the main house for supper – chicken, beer ribs, and baked potatoes. Then Michael and I went to his private theatre and watched two and a half hours of Three Stooges reruns. We ate popcorn from the theatre’s own machine, and had pizza delivered from the house. I felt a lot better and had a great time. Now I was glad I had come. …”I like your jacket,” Michael told me, “but I want you to have a heavier one.” So the two of us drove to a nearby town in Michael’s Bentley… The best part was, the man in the shop didn’t believe that Michael and his credit card were for real! Michael gave him the ranch’s security number, and he called to clear the card and the doublecheck that Michael was who he said he was. …The night we watched the new Indiana Jones movie, The Last Crusade. How lucky can you get, I thought. The lines were too long to get in at home, but I was getting a private screening. …The next day Michael had business meetings. When Michael was free, we went back to town to pick out some presents for Mom and Andrea. I got Mom a great big Santa, and magic stuff for Andrea. ..At dinner on New Year’s Eve, Michael gave me a wonderful watch. It chimes every hour and has a builtin alarm. It tells you the day of the week, the date, the month, and the year. … New Year’s Day: my last day at the ranch. I played with Max, one of Michael’s pet monkeys. I was glad to see him again, and he was glad to see my shoelaces. I puckered up for a kiss, and Max gave me a big one. I called Mom to tell her I was on my way home. It was a whole new stereo system and disc changer. A few days later I got a photo of Michael signed, “To Ryan.” He was wearing red, black, and white. Thanks, Michael! At about one o’clock Sunday morning, Michael Jackson called again from Atlantic City. When Jeanne told him Ryan was not expected to live, Michael declared he was flying to Indianapolis right away. … Ryan is dying. “I feel terrible,” he says. About 1 A.M. on Sunday, Jeanne takes a call at Ryan’s bedside from longtime family friend Michael Jackson. Michael bought Ryan a red Mustang about a year ago, and the Whites have been frequent guests at his California ranch. Michael wants to come that minute. He is in Atlantic City. “How long will it take you, Michael?,” she asks. Jeanne looks at a nurse wearing goggles. “Two hours?” she asks the nurse. The nurse shakes her head. “Michael, don’t come, honey. Ryan isn’t expected to last two hours. We know how much you love him.” Jackson says he’ll be there in-the morning, and he is. As soon as Michael Jackson arrived, he went straight to the Whites’ home in Cicero. He was very upset that he hadn’t gotten there before Ryan died. He went up to Ryan’s room, which was full of his collections, posters, and souvenirs, including his director’s chair from the movie set. In the closet was the heavy new leather jacket Michael had wanted him to wear. Michael sat quietly looking at everything for a long time. Jeanne offered him anything he liked there as a keepsake, but he asked her to leave Ryan’s room just as it was. In the Whites’ front yard sat the red Mustang Michael had given Ryan. Now it was covered with flowers and Easter eggs, gifts from children. Andrea took Michael out to show him the car and they sat in together. When Michael turned on the CD player, Ryan’s favourite song, Michael’s “Man In The Mirror,” began to play. Michael smiled proudly. He knew it must have been the last song Ryan had played. … Ryan died at 7:11 A.M. on April 8, 1990. It was Palm Sunday. ..”Michael was amazed that Ryan never talked about his illness. And he said he never wanted anybody to feel sorry for him. So I think they really had this good communication of respect for each other”. Q. 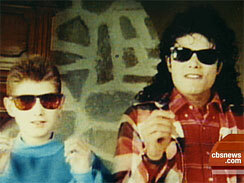 You never had any hesitation about Ryan spending time with Michael Jackson? A. No! … Michael was always interested in what Ryan was doing. He loved kids, and he didn’t care what race you were, what color you were, what was your handicap, what was your disease – Michael just loved all children. Q. He did something incredibly special when he learned what Ryan’s favorite car was? A. We had a call from a car dealer who said they had a car for Ryan. [Michael did it] just to see the joy in the kid’s face. [During the funeral] the car was sitting outside in the yard.. Michael started the car and “Man in the Mirror” was playing. The little things made Michael so happy. You could see in his eyes and he was smiling from ear to ear and said, “I was the last person that Ryan was listening to…?” and I said, “Yes”. Ryan just listened to it over and over again. Three days after the funeral Michael called me and asked me how I was doing. I said, “What made you and Ryan so close?” Michael said, “…Nobody ever acts normal round me. Ryan knew how I wanted to be treated because that’s how he wanted to be treated. I can’t trust anyone because everyone wants something from me”. Then he said, “I promised Ryan he could be in my next video, but now that he is gone I can’t put him in my video. But could I do a video for him? I was like, “That’s unbelievable”. And he did a video called Gone too soon… that’s the memory that’ll stay forever”. "I am not trying to be philosophical but I really think it’s my job to help them. I think it is my calling. I don’t care if people laugh or what they say. [Children] don’t have a mouth to society and I think it is now their time. From here on out it is their time. They need the world’s awareness and they need issues to deal with, and this is for them. And if I can be that light, that pedestal just to shine some light on who they are, and the importance of who children are, that’s what I want to do. I don’t know how God chooses people, or plays chess with people, and he does put you in position and sets you up. Sometimes I feel like that, like this is my place. Ryan White. The hardest for me is. . . I don’t understand when a child dies. I really don’t. I think there should be a window where there is a chance of dying but not in this window of time. When a child dies, or if the child is sick, I really don’t understand it. I said: ‘I have to use the bathroom,” and I ran to the bathroom and I cried my eyes out. Hearing this little boy telling his mother how to bury him. That hurt me. It was as if he was prepared for it and when he died he was in OshKosh jeans and a T-shirt and a watch that I gave him. How could your heart not go out to someone like that? And I am sitting alone in this room with him and he is lying there and I felt so bad I just wanted to hold him and kiss him and say that I love him, which I did all those things when he was alive. I took care of him and he stayed at my house. But to see him just lying there … I spoke to him and I said, “Ryan, I promised you that I would do something in your honor on my next album. I will create a song for you. I will sing it. I want the world to know who you are.” I did Gone Too Soon . That was for him." Was the dream of another tomorrow. In August 1990, four months after White's death, Congress enacted The Ryan White Comprehensive AIDS Resources Emergency (CARE) Act (often known simply as the Ryan White Care Act), in his honor. The act is the United States' largest federally funded program for people living with HIV/AIDS. The Ryan White Care Act funds programs to improve availability of care for low-income, uninsured and under-insured victims of AIDS and their families. The Ryan White Act was set to expire on September 30, 2009, although efforts began to obtain an extension to the act. The Ryan White HIV/AIDS Treatment Extension Act of 2009 was signed on October 30, 2009 by President Barack Obama, who announced plans to remove a ban on travel and immigration to the U.S. by individuals with HIV. Obama called the 22-year ban a decision "rooted in fear rather than fact." Twenty years ago this month, you died of AIDS. I would gladly give my fame and fortune if only I could have one more conversation with you, the friend who changed my life as well as the lives of millions living with HIV. Instead, I have written you this letter. I remember so well when we first met. A young boy with a terrible disease, you were the epitome of grace. You never blamed anyone for the illness that ravaged your body or the torment and stigma you endured. When students, parents and teachers in your community shunned you, threatened you and expelled you from school, you responded not with words of hate but with understanding beyond your years. You said they were simply afraid of what they did not know. When the media heralded you as an "innocent victim" because you had contracted AIDS through a blood transfusion, you rejected that label and stood in solidarity with thousands of HIV-positive women and men. You reminded America that all victims of AIDS are innocent. When you became a celebrity, you embraced the opportunity to educate the nation about the AIDS epidemic, even though your only wish was to live an ordinary life. Ryan, I wish you could know how much the world has changed since 1990, and how much you changed it. Young boys and girls with HIV attend school and take medicine that allows them to lead normal lives. Children in America are seldom born with the virus, and they no longer contract it through transfusions. The insults and injustices you suffered are not tolerated by society. Most important, Ryan, you inspired awareness, which helped lead to lifesaving treatments. In 1990, four months after you died, Congress passed the Ryan White Care Act, which now provides more than $2 billion each year for AIDS medicine and treatment for half a million Americans. Today, countless people with HIV live long, productive lives. It breaks my heart that you are not one of them. You were 18 when you died, and you would be 38 this year, if only the current treatments existed when you were sick. I think about this every day, because America needs your message of compassion as never before. Ryan, when you were alive, your story sparked a national conversation about AIDS. But despite all the progress in the past 20 years, the dialogue has waned. I know you would be trying to revive it if you were here today, when the epidemic continues to strike nearly every demographic group, with more than 50,000 new infections in the United States each year. I know you would be loudly calling for the National HIV/AIDS Strategy that was promised by President Obama but has not yet been delivered. I know you would reach out to young people. I know you would work tirelessly to help everyone suffering from HIV, including those who live on the margins of society. It would sadden you that today, in certain parts of the United States, some poor people with AIDS are still placed on waiting lists to receive treatment. It would anger you that your government is still not doing enough to help vulnerable people with HIV and populations that are at high risk of contracting the virus, including sexually active teenagers. It would upset you that AIDS is a leading cause of death among African Americans. It would frustrate you that even though hundreds of thousands of HIV-positive Americans are receiving treatment in your name, more than 200,000 don't know their HIV-positive status, largely because a lingering stigma surrounding the disease prevents them from being tested. It would disappoint you that many teenagers do not have access to science-based HIV-prevention programs in school, at a time when half of new infections are believed to be among people under 25. I miss you so very much, Ryan. I was by your side when you died at Riley Hospital. You've been with me every day since. You inspired me to change my life and carry on your work. Because of you, I'm still in the struggle against AIDS, 20 years later. I pledge to not rest until we achieve the compassion for which you so bravely and beautifully fought. Sir Elton John, a Grammy- and Academy Award-winning artist, is the founder and chairman of the Elton John AIDS Foundation.